Finding a source of Martian water – one that is not confined to Mars’ frozen polar regions – has been an ongoing challenge for space agencies and astronomers alike. Between NASA, SpaceX, and every other public and private space venture hoping to conduct crewed mission to Mars in the future, an accessible source of ice would mean the ability to manufacture rocket fuel on sight and provide drinking water for an outpost. So far, attempt to locate an equatorial source of water ice have failed. But after consulting old data from the longest-running mission to Mars in history – NASA’s Mars Odyssey spacecraft – a team of researchers from the John Hopkins University Applied Physics Laboratory (JHUAPL) announced that they may have found evidence of a source of water ice in the Medusae Fossae region of Mars. This region of Mars, which is located in the equatorial region, is situated between the highland-lowland boundary near the Tharsis and Elysium volcanic areas. This area is known for its formation of the same name, which is a soft deposit of easily-erodible material that extends for about 5000 km (3,109 mi) along the equator of Mars. Until now, it was believed to be impossible for water ice to exist there. However, a team led by Jack Wilson – a post-doctoral researcher at the JHUAPL – recently reprocessed data from the Mars Odyssey spacecraft that showed unexpected signals. This data was collected between 2002 and 2009 by the mission’s neutron spectrometer instrument. After reprocessing the lower-resolution compositional data to bring it into sharper focus, the team found that it contained unexpectedly high signals of hydrogen. To bring the information into higher-resolution, Wilson and his team applied image-reconstruction techniques that are typically used to reduce blurring and remove noise from medical and spacecraft imaging data. In so doing, the team was able to improve the data’s spatial resolution from about 520 km (320 mi) to 290 km (180 mi). Ordinarily, this kind of improvement could only be achieved by getting the spacecraft much closer to the surface. “It was as if we’d cut the spacecraft’s orbital altitude in half,” said Wilson, “and it gave us a much better view of what’s happening on the surface.” And while the neutron spectrometer did not detect water directly, the high abundance of neutrons detected by the spectrometer allowed the research team to calculate the abundance of hydrogen. At high latitudes on Mars, this is considered to be a telltale sign of water ice. The first time the Mars Odyssey spacecraft detected abundant hydrogen was in 2002, which appeared to be coming from subsurface deposits at high latitudes around Mars. These findings were confirmed in 2008, when NASA’s Phoenix Lander confirmed that the hydrogen took the form of water ice. However, scientists have been operating under the assumption that at lower latitudes, temperatures are too high for water ice to exist. In the past, the detection of hydrogen in the equatorial region was thought to be due to the presence of hydrated minerals (i.e. past water). 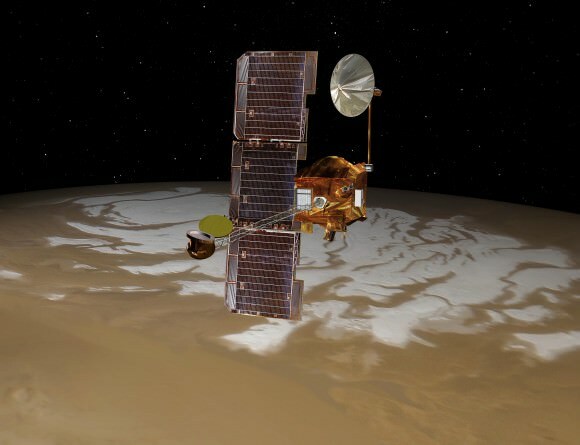 In addition, the Mars Reconnaissance Orbiter (MRO) and the ESA’s Mars Express orbiter have both conducted radar-sounding scans of the area, using their Shallow Subsurface Radar (SHARAD) and Mars Advanced Radar for Subsurface and Ionospheric Sounding (MARSIS) instruments, respectively. Given Mars’ thin atmosphere and the temperature ranges that are common around the equator – which get as high as 308 K (35 °C; 95 °F) by midday during the summer – it is a mystery how water ice could be preserved there. The leading theory though is that a mixture of ice and dust was deposited from the polar regions in the past. This could have happened back when Mars’ axial tilt was greater than it is today. However, those conditions have not been present on Mars for hundreds of thousands or even millions of years. As such, any subsurface ice that was deposited there should be long gone by now. There is also the possibility that subsurface ice could be shielded by layers of hardened dust, but this too is insufficient to explain how water ice could have survived on the timescales involved. In the end, the presence of abundant hydrogen in the Medusae Fossae region is just another mystery that will require further investigation. The same is true for deposits of water ice in general around the equatorial region of Mars. Such deposits mean that future missions would have a source of water for manufacturing rocket fuel. This would shave billions of dollars of the costs of individual mission since spacecraft would not need to carry enough fuel for a return trip with them. As such, interplanetary spacecraft could be manufactured that would be smaller, lighter and faster. The presence of equatorial water ice could also be used to provide a steady supply of water for a future base on Mars. Crews could be rotated in and out of this base once every two years – in a way that is similar to what we currently do with the International Space Station. Or – dare I say it? – a local source of water could be used to supply drinking, sanitation and irrigation water to eventual colonists! No matter how you slice it, finding an accessible source of Martian water is critical to the future of space exploration as we know it!